This is an NCLEX review for pneumonia. Patients who have pneumonia are experiencing an infection of the lower respiratory system that affects the alveolar sacs. Pneumonia leads to impaired gas exchange which can require mechanical ventilation if severe enough. 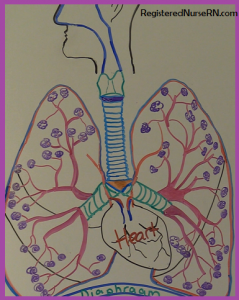 In the previous review, I covered other respiratory disorders of the respiratory system. So, if you are studying for NCLEX or your nursing lecture exams be sure to check out that section. When taking care of a patient who is experiencing pneumonia it is very important the nurse knows how to recognize the typical signs and symptoms seen in this condition, how it is diagnosed, nursing interventions, and patient education. Don’t forget to take the pneumonia quiz. 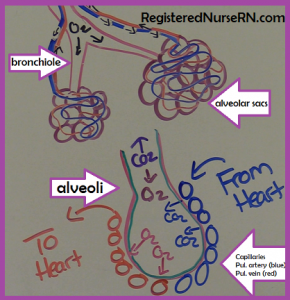 then into smaller branches called bronchioles to the alveolar ducts to the alveolar sacs which inflate and deflate to allow gas exchange. During this process, there is the transfer of oxygen from inhalation into the bloodstream and transfer of carbon dioxide out of the blood through the lungs which is exhaled. This happens in the alveoli capillary wall. Then the fresh oxygenated blood is taken back to the heart through the pulmonary vein and is pumped through the heart to the body. Normally, the respiratory system can “fight off” these type of germs by filtering the air taken in through the nose and airway BUT certain conditions can damage the body’s ability to do this and make the body more susceptible to developing PNA. These germs get into the lungs by inhalation, aspiration, or from the blood and attack the alveoli sacs. These sacs become very inflamed and fill with fluid, body’s immune defense cell RBCs and WBCs, and bacteria. This causes the sac to lose the ability to inflate and deflate which allows proper gas exchange. Therefore, the patient will start to experience HYPOXEMIA (low oxygen in the blood) because oxygen cannot transfer across capillary wall to attach to RBCs to supply the body with oxygen and the body keeps the CO2 (carbon dioxide) which leads to RESPIRATORY ACIDOSIS! Fungi: least common…most likely to affect people with severe suppressed immune system and typically is contracted from outside in nature from plants, animals etc. Community-acquired Pneumonia (most occurring): patient obtains the germs that causes the pneumonia OUTSIDE of the healthcare system hence in the community. Notice: abnormal lungs sound when auscultating with stethoscope may hear coarse crackles, rhonchi (type of wheezing) or bronchial breath sounds which should be noted only in the tracheal area and this represents lung consolidation. Keeping head of bed elevated greater than 30 degree for immobile patients to prevent aspiration especially while eating and after meals along with frequent turning. Breathing treatments and other respiratory therapy treatments (usually by respiratory therapy department). These will be schedule or PRN (as needed). Treatments include: Bronchodilators, chest percussion etc. Antibiotics used depend on the bacteria type that is causing the infection, the patient’s ability to tolerate etc. Tetracylines: “Doxycycline” broad-spectrum that targets gram positive and negative bacteria. Side effects: not for pregnant women or 8 years or younger due to growth retardation and teeth discoloration, photosensitivity of the skin and decreases effectiveness of birth control, no antacids or milk product while taking this medication because it affects absorption.